What are your favorite savory peanut butter recipes? This tangy peanut sauce with a Sriracha kick might be my new favorite. Here it brightens up an otherwise-ordinary bowl of tofu, greens, and rice, but I can see it making other kinds of future appearances in my kitchen. I’ll be dipping spring rolls in it for sure, and I think it would make a great dressing for a quinoa salad with raw kale and lots of shredded carrots. You know me, I might even try some out in my next bowl of oatmeal. Just one caution, which is that I recommend removing your tofu and/or veggies from the heat before tossing them with the peanut sauce. The sauce loses a bit of its bright flavor when cooked. 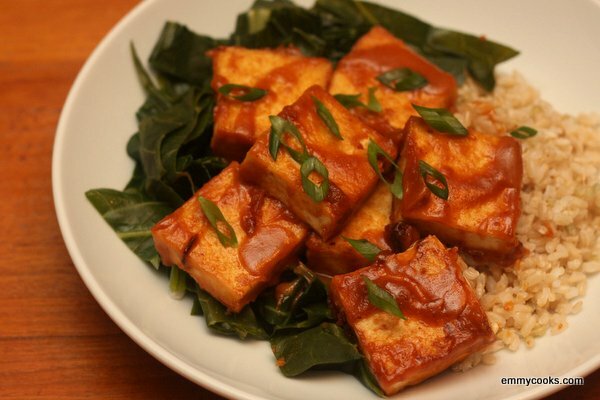 Spicy Peanut Butter Tofu With Greens and Rice (adapted from Kalyn’s Kitchen–thank you, Kalyn! ): First, start a pot of rice. Then make the peanut sauce in your blender by combining 3 Tbsp. smooth peanut butter, 3 Tbsp. rice vinegar, 2 Tbsp. soy sauce (reduced sodium is fine), 2 Tbsp. water, 1 ½ Tbsp. sriracha, and 1 Tbsp. honey. Blend until smooth. Cut a block of extra-firm tofu into thick slices. Drain on a lint-free-towel, pressing lightly to remove as much water as possible. Sear in vegetable oil over medium-high heat. Once the tofu pieces are in the pan, leave them alone until they form a crust and release easily from the pan, then flip and cook on the second side until both sides are golden. While the tofu is cooking, steam or simmer a bunch of greens in a separate pot. I simmered a bunch of collard greens in about 1” of salted water until tender. (If you take this approach, use a tongs to remove the greens and freeze that cooking liquid for your next batch of homemade vegetable broth!) Slice the greens into ribbons and set aside. When the tofu is cooked on both sides, turn off the heat and add a few spoonfuls of peanut sauce to the pan, gently tossing until the tofu coated. (If the greens have cooled, you could add them to the pan for a moment to re-warm them before adding the sauce.) Layer rice, greens and tofu onto a plate, then drizzle additional sauce on top. Garnish with sliced green onions. This looks fantastic! I think I just planned dinner for tonight – thank you. I could easily eat a bowl of peanut sauce, and anything it adorns is delicious. I’ve made a pureed sweet potato soup before with peanut butter that was quite good. That is a perfect meal for a rainy day like today. Do you have any leftovers? I am swinging by for a plate! So glad you enjoyed the recipe. I think peanut butter makes everything else taste better! This is definitely going to get made around here. I don’t think one can ever get to old for peanut butter. I eat it in some form nearly every day, and peanut sauces like this are one of my favorite ways to eat it. I have a box of tofu that has been sitting in the fridge for months cos i am never really sure what to do with it. It just keeps getting puched to the back of the shelf and forgotten about! Now i know what i am going to try out! This recipe sounds and looks great! Thanks for the inspiration! Just checked, it is silken :( and guess what.. expired July 2012 :( damn and blast, i can’t believe it, i hate to waste it.. do u think i should bin it then?? :P o well.. that’ll teach me to ignore the tofu! I must try to find the other type of tofu then. There aren’t too many options round here to buy veggie or vegan products. Mexico is a very carnivorous country and Manzanillo where i live is a very small city by the sea and we don’t have a good selection of health stores. The only place i know to buy tofu is in the supermarkets and i try to avoid those as much as possible. What is the kind of tofu that you recommend? Oh boy, this looks so yummy :) Thanks for sharing!